Except that reality is a bit more complicated, as evidenced by two of the most prominent observations of protoplanetary disks, which were made with ALMA, the Atacama Large Millimeter/submillimeter Array in Chile. ALMA is an assembly of radio antennas between 7 and 12 meters in diameter and numbering 66 of them once completed. 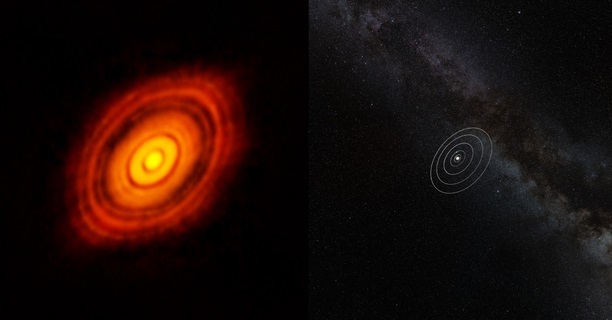 The images of HL Tau and TW Hydra, obtained in 2014 and 2016, respectively, have revealed the finest details so far in any protoplanetary disk, and they show some features that are difficult, if not impossible, to explain with current models of planetary formation, Dong says. "Among the gaps in HL Tau and TW Hya revealed by ALMA, two pairs of them are extremely narrow and very close to each other," he explains. "In conventional theory, it is difficult for a planet to open such gaps in a disk. They can never be this narrow and this close to each other for reasons of the physics involved." In the case of HL Tau and TW Hya, one would have to invoke two planets whose orbits hug each other very closely — a scenario that would not be stable over time and therefore is unlikely.